There are movies. And then there are MOVIES. WWII has just ended and three servicemen meet on their way back home to the town of Boone City. Air Force Captain Fred Derry, Infantry Sergeant Al Stephenson and Sailor Homer Parrish. During the day-long journey home, the three men forge a friendship and we get to know them, intimately. 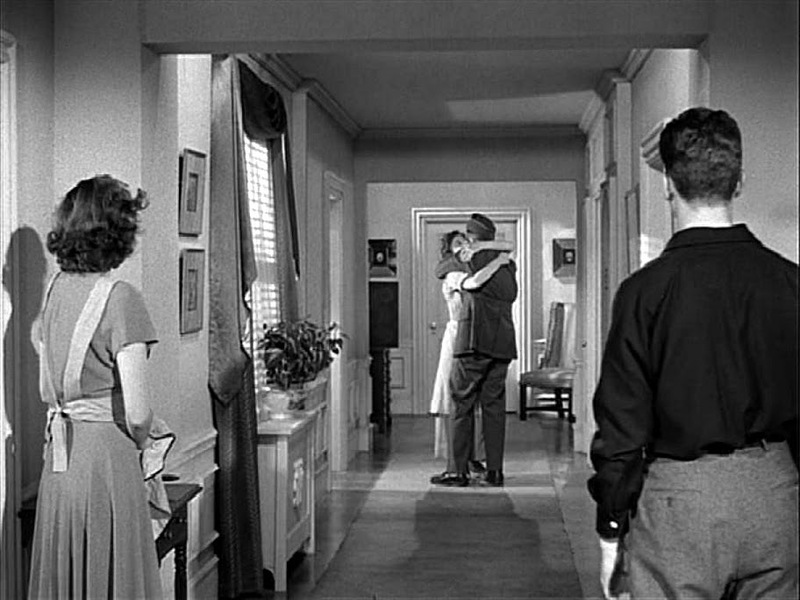 This is William Wyler’s, The Best Years of Our Lives (1946). William Wyler made many great films, several that are unforgettable. The Best Years of Our Lives is the best of them. It’s very rare that I say “best” in any category pertaining to classic films. My taste changes daily as I watch one classic after another, constantly reminded of greatness in art, each unique and incomparable. 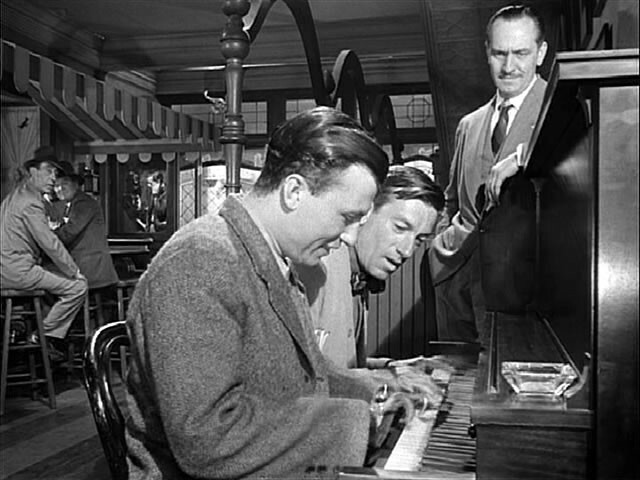 But in the case of Wyler’s 1946 film, I state it is the best of his without reservation. The Best Years of Our Lives is a deeply affecting film about the trials and tribulations of these three men as they face life after war – the anxieties and fears of facing your everyday life. It is my favorite “war” film bar none, even though there are no epic battles fought in it. Still, there are battles here. Deep battles inside the men, perhaps the most difficult to fight – intangible demons. This film is beautifully done, features a dream cast who churn out memorable performances. Best Years was filmed in a natural manner to reflect ordinary people, ordinary lives in an ordinary place. The glorious Myrna Loy (who gets top billing in this film, which surprised me but she was the biggest female star at the time. 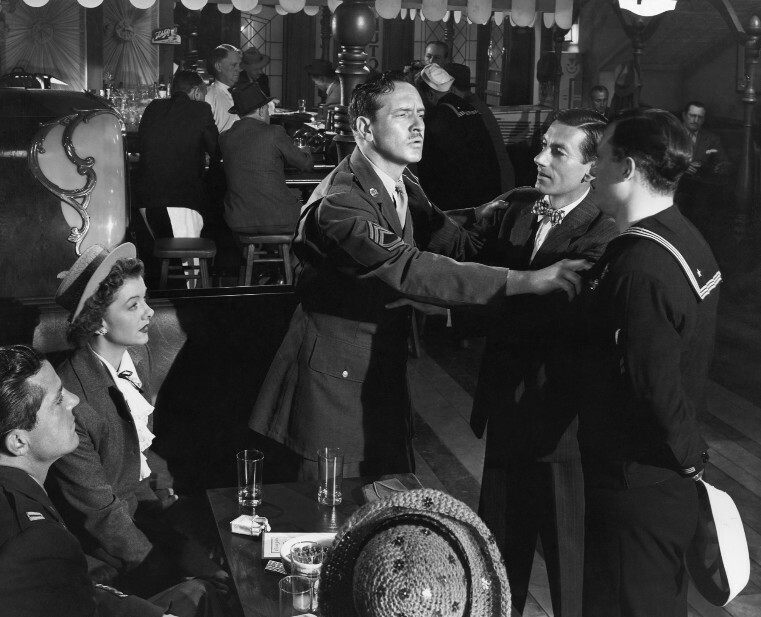 ), the commanding presence of Fredric March, the ‘everyman’ charm of Dana Andrews, the classic Theresa Wright, the unforgettable Harold Russell and an outstanding cast of supporting players with new-comer, Cathy O’Donnell as Homer’s girl, Wilma and the great Hoagie Carmichael who adds so much to the film in his portrayal of Homer’s uncle, Butch who’s the owner of the establishment where the characters often gather. 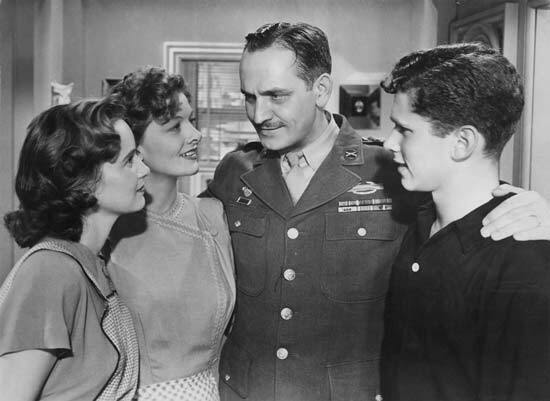 The Best Years of Our Lives is a much beloved film if, perhaps, not necessarily familiar to today’s audiences, which is a shame. I wanted to be sure to do it justice with this dedication because it should be seen today. Although it reflects a specific time in our history its theme is universal and still relevant. Finding a new perspective on the film is difficult, however, since people have been discussing it for over six decades. So, instead of getting into the nitty-gritty of the entire film, I chose three scenes, one for each of the three servicemen, which was a difficult task on its own. Best Years is replete with memorable scenes. 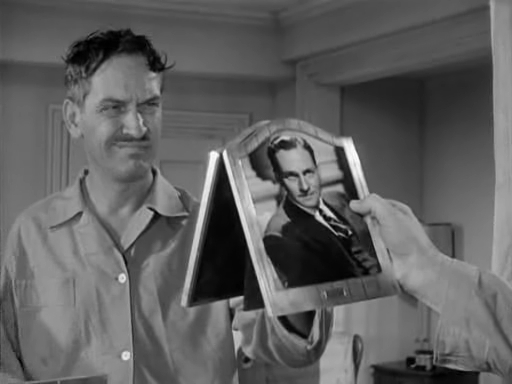 Sergeant Al Stephenson (Fredric March) steps into the lobby of his ritzy apartment building in Boone City. As he passes the lobby attendant, bags in hand, the man stops him and asks who he’s there to see. Al’s been away too long for the front desk guy to recognize him. We know he feels he’s missed out on too much. We know he’s nervous, more so than if he were about to step into battle in the war. He takes the elevator up to the 4th floor, drops his bags at the front door and rings the bell. Nerves are evident. His teenage son opens the door and Al immediately covers his mouth – he wants to surprise his wife, Millie (Myrna Loy). Al steps in and is seen by his daughter, Peggy (Teresa Wight) who realizes he wants her to not make a noise. Then Millie is heard from another room, “who was that at the door?” Wyler shoots toward where her voice is heard, a long hallway where Al stands all but frozen. Cut to the kitchen where Millie stands preparing something. Then her body goes stiff, her head slowly rises as she realizes she got no answer to her question, which can mean only one thing. From the previous shot down the hallway, we see Millie step out into view. Where Fred can see her. They run toward each other. They embrace. Not a word is uttered. This is a long marriage, an established love. Two people who don’t need the words. He’s home. A gorgeous scene that never fails to move me. 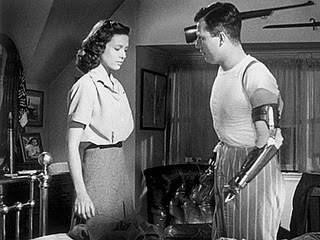 Homer Parrish (Harold Russell) lost his hands in the war. By the time he arrives home, he’s as fully functional as can be. The adjustment he had to do upon his return to Boone City was more internal than outwardly. Easily able to shrug off and address the comments and looks from strangers, he has a difficult job with the looks and insecurities of those he loves. It just takes time, he misunderstands concern for judgment and pity. So he closes off from them. We see the nightly ritual Homer is forced to go through, the only time of day when he cannot do without assistance. When Homer’s ready for bed he lets his father know. The older man helps him after Homer has removed his prosthetic hooks for the night. Again, another long scene – no words needed. One night, Homer’s high school sweetheart, Wilma, who’s still in love with him comes over to speak with him. Homer loves her but has been purposefully distant since his return. He will accept the assistance of his father, what choice has he? But he doesn’t want Wilma to feel burdened, to be burdened for the rest of her life. On this particular night, Wilma is concerned. Since Homer has not shown much interest toward her, her parents will send her away to be with relatives, perhaps a new college where she can meet someone else. Homer takes her up to his room to show her his reality. Wilma goes willingly but is afraid. Homer is sure that showing Wilma the nightly ritual, allowing her to see him without hands, when he is completely vulnerable and helpless, will cause her to run for the door is quite shocked to see she embraces him. She’s truly in love with the man. He hugs her for the first time. She assists him into bed, tucks him in and leaves. A small tear runs down his face. His miracle. A lovely, tender scene. True love. 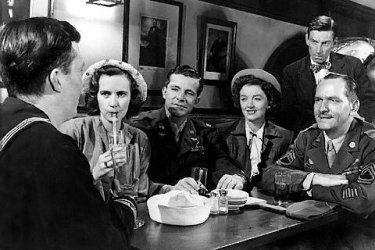 Fred Derry (Dana Andrews) had been a soda jerk before he went off to war. Upon his return, now a war hero although he tells no one, he had lofty goals for a job outside the drugstore he’d previously worked in. But there are no jobs available for veterans when he returns to Boone City. Or none, at least, that don’t require him to serve ice cream to teenagers. 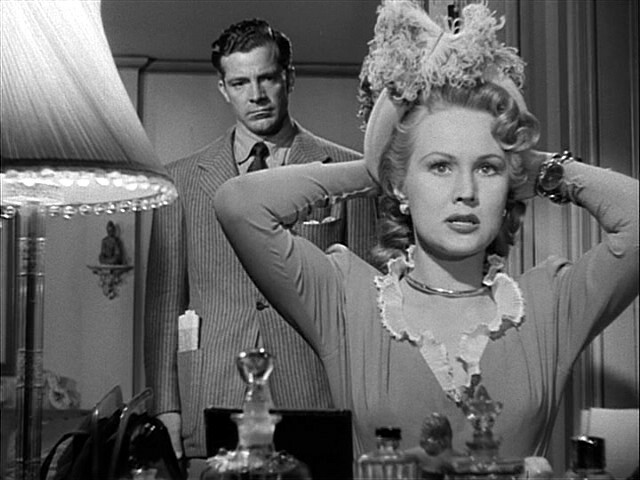 Add to that the situation with his wife Marie, played by Virginia Mayo, a party girl, and the fact Fred has fallen in love with Al Stephenson’s daughter, Peggy and she with him. Desolate and nearly destitute Fred makes up his mind – he needs to find a future outside Boone City. Fred makes a stop at what is referred to as a grave site for discarded planes. A junkyard. He goes into a plane, toward the nose where he’d once found glory. One can’t help but realize both he and the plane have been relegated to heaps by society. It’s a powerful scene as Fred sits, motionless remembering the war, about when he mattered. As we see him sitting there we hear the sounds of war, where his mind has gone. 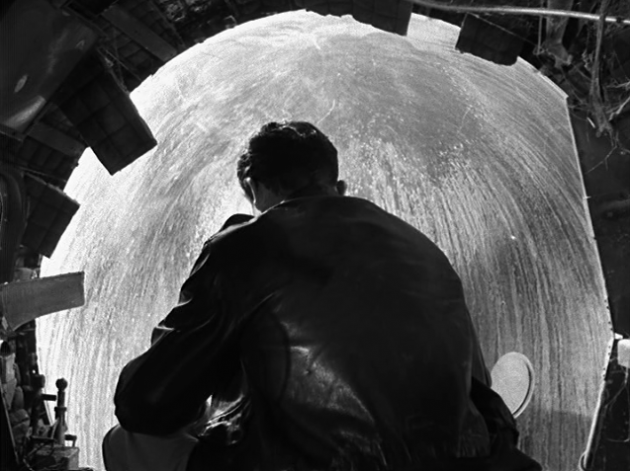 Wyler makes it a point to show us not only the man from an observer’s perspective, but then shows us Fred’s perspective – sadly, where he feels most at home, where he’s been most accomplished, behind a beaten up window where the view is not quite so clear. It turns out that that particular day’s visit to the plane grave site ends up allowing Fred a future. Planes and he are destined to be together. Sometimes looking back helps us move forward in strange ways. 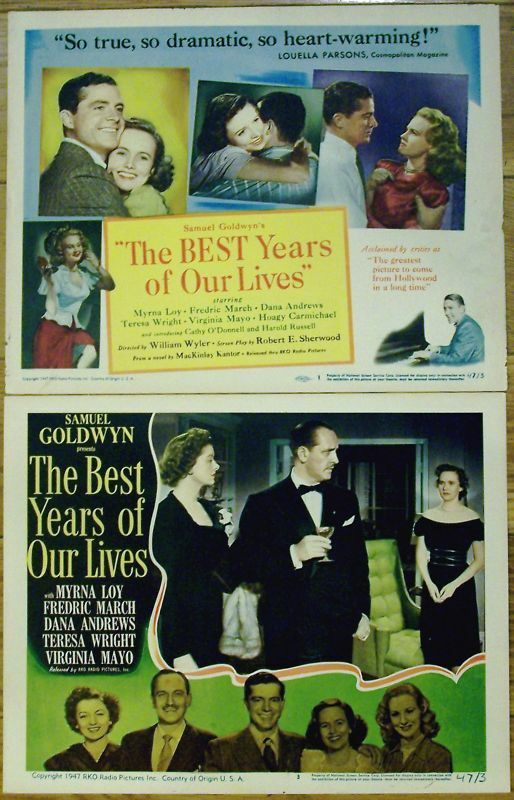 In The Best Years of Our Lives William Wyler made a movie about everybody and anybody, a movie where the grandest of Hollywood stars are believable as people from anywhere U.S.A. That is the film’s greatest virtue, if I may call it that. There is something in this for everyone. Any number of scenes are capable of moving an audience because it can relate. I mentioned just three scenes but, as I noted above, the entire film is worthy of accolades. I’ll add also that there are several scenes where all these great actors converge through their characters adding to the awe. Individually these people have outstanding screen presence. Put them together and it’s magic, on an ordinary scale because they are us. 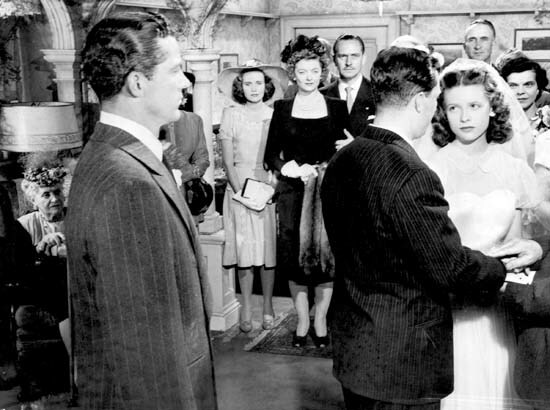 In 1946 The Best Years of Our lives became the most successful film at the box office since Gone with the Wind which was released 7 years earlier. Best Years also went on the receive a total of eight Academy Award nominations, winning seven. 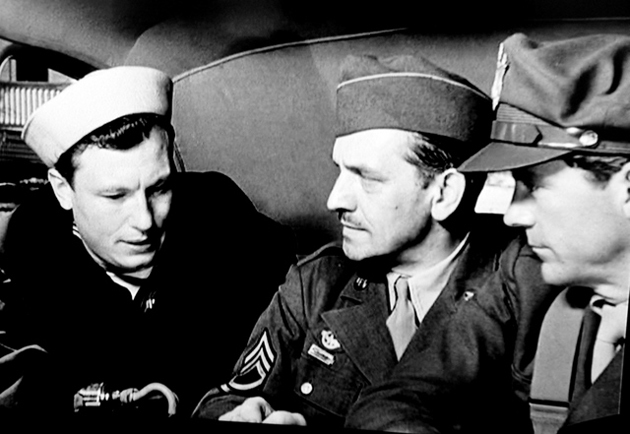 These included Best Picture, Best Director, Best Actor to Fredric March, Best Supporting Actor to new-comer, Harold Russell, who also received an honorary Oscar “For bringing hope and courage to his fellow veterans” through his appearance in the film, Best Score and finally, Best Screenplay. 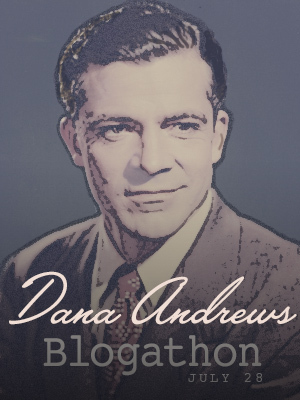 This post is my entry to the Dana Andrews blogathon hosted by Classic Movie Man, which he is hosting to commemorate the release of a new Dana Andrews biography expected this September. Andrews was a major Hollywood star in the 1940s and 1950s, becoming a certified star with The Best Years of Our Lives but starred in many films now considered classics, several great noir films in particular, like Otto Preminger’s highly acclaimed, Laura (1944). Despite his great career, I have to confess I am not all that familiar with his work outside of his role in both Preminger’s film and Best Years. I am hoping to remedy that, however, as part of my new commitment to expanding my classic movie knowledge. I also look forward to reading the biography when released. The few things I’ve read about Dana Andrews indicate he lead a very interesting life – he was an accomplished opera singer, was president of the Screen Actor’s Guild and was very vocal for actor’s rights his entire life. He was also faced with, and overcame, a lot of adversity. His was a life worth knowing. As far as Mr. Andrew’s performance in The Best Years of Our Lives I can add that it’s quite good. His character, Fred Derry, deals with what I view as the most difficult personal adjustment of the three veterans upon his return to the “real” world. Despite Homer’s difficulties with his physical change after the war, Fred’s wounds run deeper tied to his self-worth as a man. 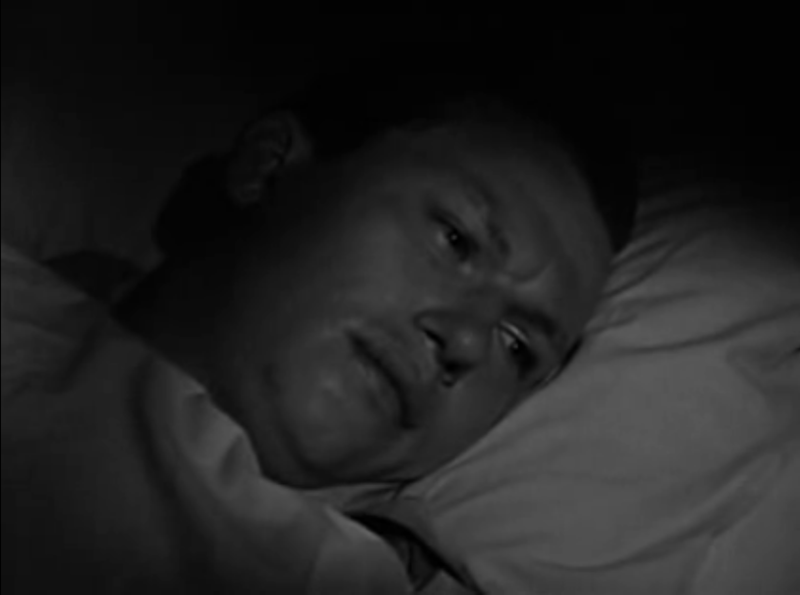 Andrews plays him simply, choosing a naturalistic style, which matches the rest of the film, but results in a performance that somehow give us a glimpse of deep emotions ever simmering beneath the surface. Hopefully it’s clear how much I love The Best Years of Our Lives. As far as classics go I’m keeping this one among my souvenirs. To read other Dana Andrews posts submitted by great writers, lovers of classic movies, please go to the Dana Andrews blogathon page at the Classic Movie Man’s site, which you can access here. Absolutely wonderful, Aurora! You’ve outdone yourself- and that’s really saying something! Well, thank you, Kellee! Such a wonderful film – inspiring. I had to be careful or I would’ve made the post several times longer. I absolutely love these three scenes you’ve highlighted, especially the one of Dana Andrews sitting in the cockpit of that plane. That is a brilliant piece of film making, one that I could watch over and over. Great post! Thanks, Ruth! Just three scenes but MAN OH MAN are they something! Anyone one of us can write a book about what I’ve left out. So much to adore and cry over in this. Brilliant indeed! Aurora, you’ve done it again. I’m sitting here wiping my tears. It was almost like watching those scenes. That shot where Al and Millie embrace and the children are looking on – I just stared at it. It’s a moment of the film where I begin to shred. 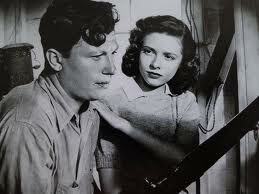 Harold Russell was amazing, wasn’t he? Wilma loved the man. Yes. Period. Tonya, you’re too kind and almost set off the waterworks again. I have to step away from my desk and “powder my nose.” The scene with Fred’s dad reading the commendations kills me. Just too many to mention in detail. yes yes and yes. 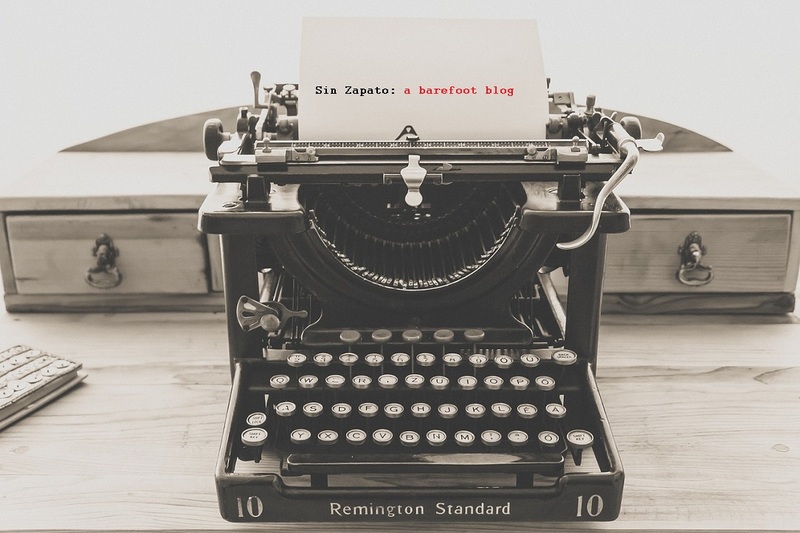 not much more to add other than, one of the greatest movies ever, certainly one of the best of all the actors involved, especially of Dana’s to whom this blogathon is dedicated, and a fantastic post! Thanks for it. 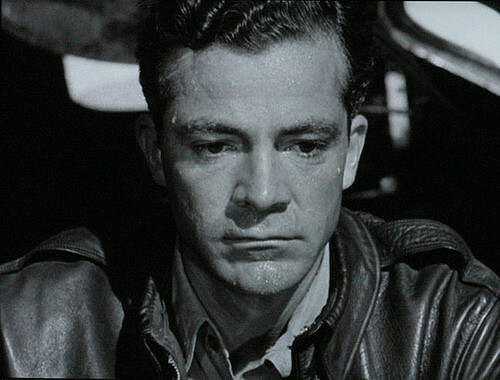 Thanks for taking part in the Dana Andrews blogathon http://bit.ly/zkiyTk. Great job and justice to a wonderful classic film that just may be one of the greatest ever! Wonderful. Thanks for having me. I’m so ill-versed on Dana Andrews films – certainly compared to the other fabulous contributors. I think this event will remedy that. But this film I know by heart, love and it was a pleasure commenting on it. Aurora, you did a wonderful job of bringing those three scenes to life. Let me add another one: when Fred visits his parents. I can never get over the shock at seeing the kind of shack they live in. Suddenly, it is understandable why Fred was a soda jerk before the war and why, now, he feels uncomfortable in these surroundings. He’s gone way beyond his beginnings, although he is certainly not ashamed of where he comes from. That same could be said of Dana Andrews himself. He KNEW Fred Derry. I see that, as you say, Andrews “knew” Derry. My interest is certainly peaked with regards to reading the Autobiography as soon as it is released. All the scenes where Fred goes home are so affecting, sincere. So familiar to families that deeply love each other and it is evident yet no outwardly signs of affection is shown. When Fred leaves and he and his father shake hands, that hesitation for a brief moment says so much. But it’s there, the love and admiration, the support. As I stated already, a truly wonderful film with scenes worthy of discussion from beginning to end. Thanks so much for your comments. I’m glad you liked this. Keep it coming, wrrseit, this is good stuff. 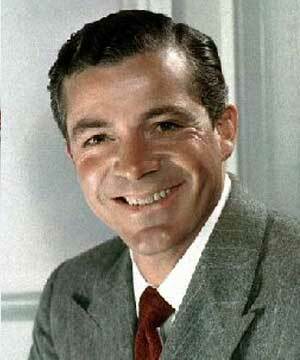 Well, after you read the other posts, you’ll be a Dana Andrews expert! I too love the scene where Fred goes home to his dad and stepmother’s place. It’s very moving. Fred’s dad is so proud when he reads his son’s commendation letter. You can tell he’s just “this close” to weeping. Makes me tear up every time I watch it. I do tear up. Wonderful. And I already started a Dana Andrews MUST SEE list from all the entries. Some Dana Andrews films to put on that list not covered today: My Foolish Heart and Canyon Passage. My Foolish Heart was the Love Story of the day and Canyon Passage is an interesting Technicolor western. Just noticed BOOMERANG! is playing on TCM this afternoon. DVR is set! Thanks for the additional must-sees. this movie is such perfection. Timeless. Still pertinent. One everyone should see. Probably the best movie ever made, I think. I don’t know how many times I’ve seen it, yet its powerful effect never diminishes. Your enthusiasm for the movie is infectious, and those screen caps are great. Thanks. Aurora, Like you, I love this movie and always have to watch it when it’s on TCM, even though I can watch it anytime I want to since I have the DVD. 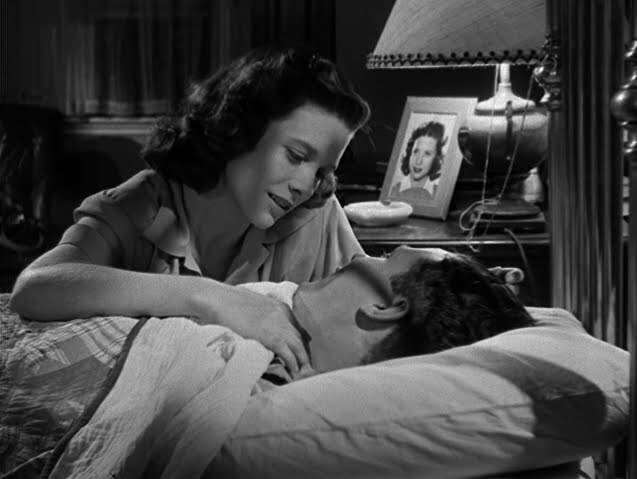 I think my favorite scene is between Dana and Teresa Wright when she sees him at the drug store and he pretends she’s a customer so he can flirt with her. It’s absolutely perfectly played by two great talents. Amazing and moving every time I watch it. Andrews is so excellent in this fllm. He makes Derry so damaged. It’s such a moving film. “Damaged is an interesting word to use. I don’t see Fred as damaged. He’s not damaged. He’s just been through alot in the war. There is a tendency to brand all veterans as “damaged” when they are just trying to adjust to life at home after some pretty stressful experiences. This film is definitely a MOVIE. My favorite scene is when Myrna Loy and her husband are reunited. This movie has a lot of soul. I listed it as one of my favorite Loy films in my recent post about her – I hope I did it justice. Hi Margaret – I’ll read your post in a bit. I love that scene so much I just finished a post for Myra Loy myself as tomorrow’s entry in the SUTS blogathon and mention it there again. It’s just so heartfelt. Great review of a great film, and wonderful pictures. I think Virginia Mayo proved she was more than a pretty face in this, and it’s always good to see the smooth Steve Cochran. A terrific cast, isn’t it. Myrna and Fredric made a great team. 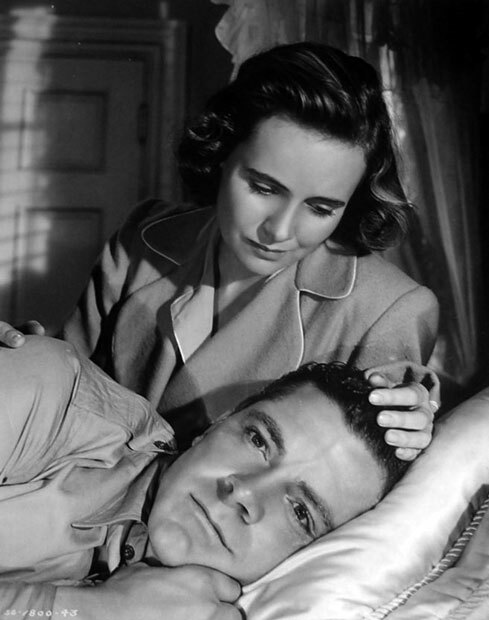 I love Hoagy Carmichael : and Dana Andrews and Teresa Wright are also so right together. I never understood how Teresa didn’t become a big star after this and her earlier Shadow of a Doubt. So many good Dana Andrews films for you to catch up on – Daisy Kenyon,The Ox-Bow Incident,Beyond a Reasonable Doubt,Where the Sidewalk Ends are ones I like. I have those on my “must see” list. Unfortunately the only strides I seem to make are adding films to that, rather than actually watching a whole lot of ’em. There’s never enough time for all those fabulous films. I agree on all but it is particularly baffling about Theresa Wright. Not only was she a great actress in some wonderful films, she had star quality screen presence, I think. A few things that stalled Wright’s career. She was supposed to star in “Duel in the Sun” in the role that went to Jennifer Jones. Wright’s husband at the time Niven Bush wrote it specifically for her. She had to drop out because of pregnancy. She dropped out of “The Bishop’s Wife” for the same reason. The latter was supposed to have reunited her with Dana Andrews who was set to play the bishop when David Niven was originally cast as Dudley, the role that eventually went to Cary Grant. Andrews became unavailable and Niven became the bishop. Lastly, she was under exclusive contract to Sam Goldwyn. She was cast in a movie that she didn’t like, “Enchantment,” which she refused to do publicity for. Goldwyn fired her in a very public way and that pretty much ruined her status as an A-list star in Hollywood. 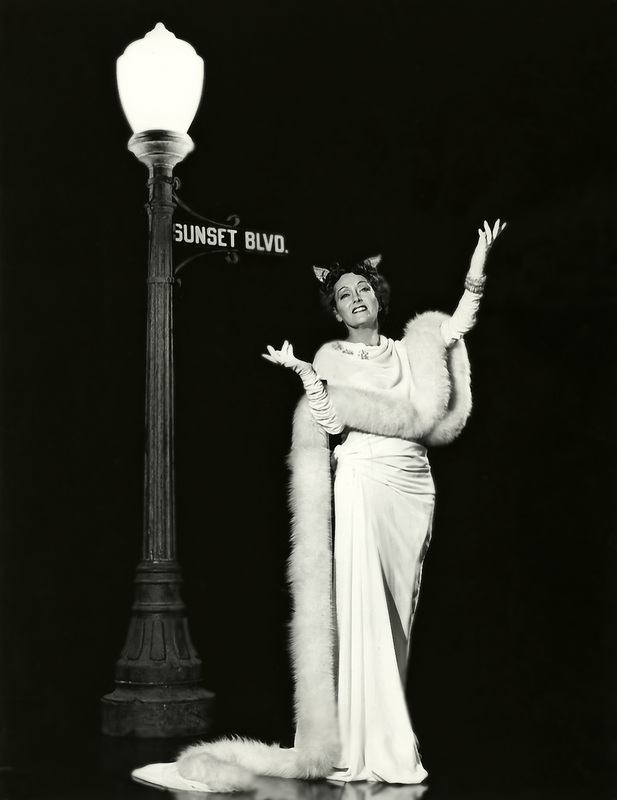 Lastly, Wright never wanted to be a glamorous movie star, but an actress. She had an unusual contract, at the time, that gave her a lot of autonomy on how her image would be created and maintained. 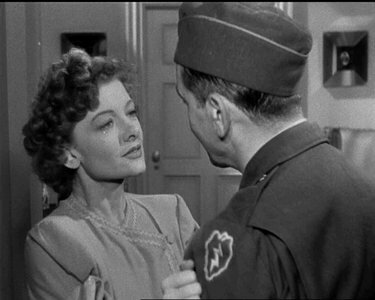 In spite of the above, she was still a major star after “Shadow of a Doubt” and she got some of the best reviews in the “Best Years of Our Lives” for her role as Peggy ” No easy task when you consider this film was the high-water mark for most members of the cast. She still holds the record for achieving three Oscar nominations for her first three films and has a body of work that most actresses today would die for. But, boy what she could have done had she not been fired (and basically blackballed) by Goldwyn. So true! Great stuff!! Thanks so much for commenting. 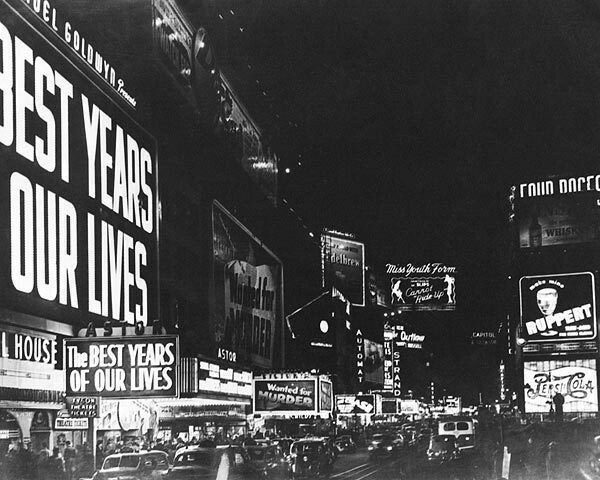 The Best Years Of Our Lives is one of the best films ever made. What a top notch cast in here. I consider this a “war on the home front” film. This along with Since You Went Away and Pride Of The Marines I consider the three essentials in these kind of films. Teresa Wright was a great actress and if you ever want to catch her with Brando, give The Men a shot. It is similar to Garfield’s movie, Pride Of The Marines but not quite as good. YES! To everything you say! I saw The Men but it’s been eons so I barely remember it. I welcome all these tidbits!